Check your map for "!" marks. We all know that there are bugs in Mists of Pandaria. That’s what us beta testers are supposed to be doing, finding and reporting bugs, so that Blizzard can fix them before release. With that being said, there are a number of quests that are bugged and can’t be completed. Right now there are 4 quests in the Jade Forest that just seem to defy everyone. Acid Rain, Wisdom of the Ages, The Jade Witch, and Getting Permission. And since you can’t complete them you can’t go any farther, right? If you’re stuck and can’t go any farther the first thing to do is look at your map. They’ve marked quests that you can pick up with little exclamation points now. If you see any, go there and pick up the quests. 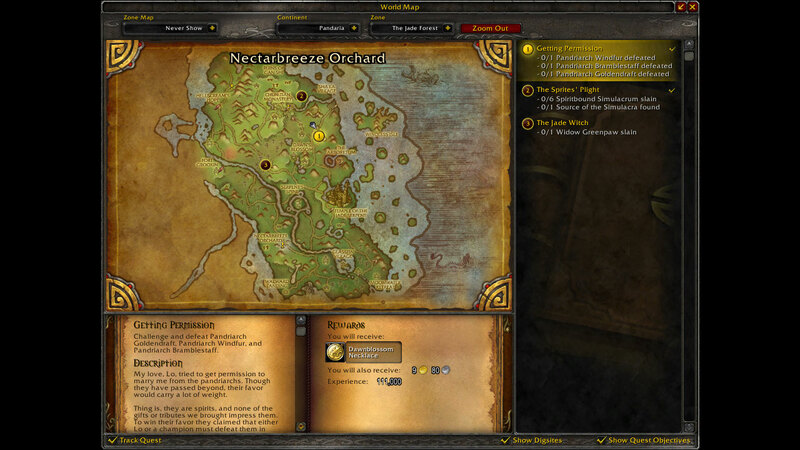 Or you could check out the following places that have quests that are outside of the main quest-line. P.S. You know those quests that are bugged? Try doing them right after a server restart. Most of them will work then and only bug out after time. « MoP Beta: Questions, questions, questions!!! This last round going though Jade forest on my priest, I seemed to get caught on a lot more bugged quests.